[3 mins. 15 secs.] Kenneth Eng has made a documentary about his father's story called My Life in China. Yau King Eng fled China's Cultural Revolution in 1966. After risking his life to get to America, he started a family in Boston. But when his restaurant went bankrupt and his wife mom sick, he began to feel like he’d failed at the American Dream. My Life in China is a story of migration passed down from father to son; the film attempts to retrace the precarious steps Ken's father took in search of a better life. Ultimately asking the question, what does it mean to be both Chinese and American? The film has recently streamed on America Reframed and is currently available on iTunes. [25 mins.] 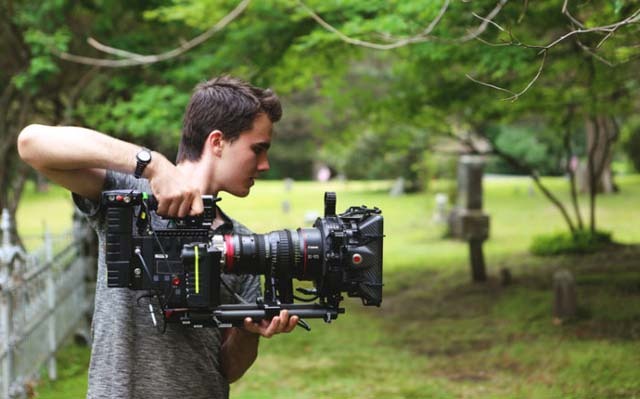 Jack Fessenden, 17 years old, has been making short films for years now. Making them is an understatement. He writes, directs, acts, edits, and scores them. "Stray Bullets" is Jack's feature debut and stars himself, his Dad Larry Fesssenden, James LeGros, and Kevin Corrigan. Beginning on Friday, February 10th, "Stray Bullets", a crime caper, will enjoy a theatrical engagement in about 10 cities around the US including at the Village East in NYC and at the Laemmle in LA. It will also be available on various digital platforms. All music in this episode is by Morricone Youth from their new vinyl album "Mad Max" (Country Club Records/Light In The Attic/ Revolver USA), a frantic and high-powered original live re-score for George Miller's classic 1979 Australian dystopian action film.